We celebrated my sweet girl’s first birthday this weekend! I’ve known for awhile I wanted to do the “You Are My Sunshine” theme. I always sing the song to Emma Ramey when I wake her up from naps, and I’ve called her “Sunshine” forever. She is just a little ray of sunshine if you know her, so I thought it was perfect! I absolutely love how her cake turned out! A local baker did it for us…I’d highly recommend them if you’re in my area. 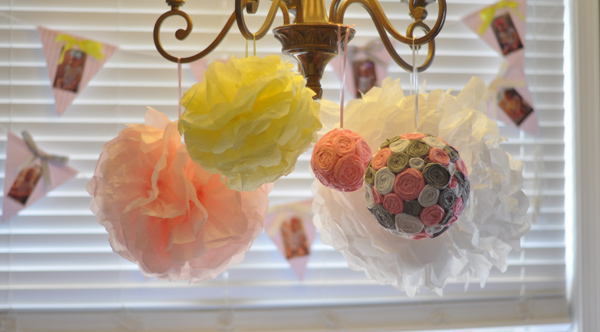 The rosette balls were truly a labor of love. 🙂 Anybody can make them, but they are time-consuming. Here’s where I got the idea! The bunting behind the food table had all of her monthly pictures. It was so neat to see the progression! Her smash cake matched her big cake. This high chair was actually one I used when I was a little girl! Here’s our drink table. I did the printables, and got this great idea from Sarah to make water bottle labels. Our entry table had favor cookies by the super, super talented Holly, and another labor of love – ribbon topiaries. 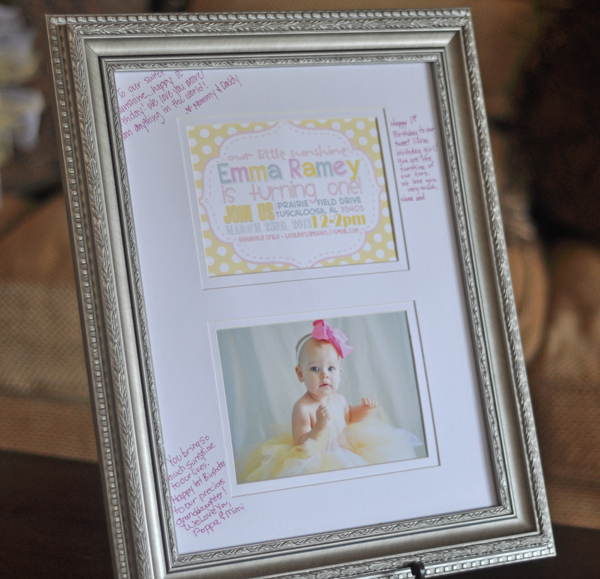 We had a signature frame for everyone to sign with her invitation and her picture! Just before the party, my sweet birthday girl woke up from her nap on got that party dress on! She was SO excited and in such a happy mood. We had lots of family and friends…several friends were out of town (note: don’t plan a party during spring break when most of your friends are teachers), but we loved having the ones that got to make it! We also re-did the smash cake experience. If you follow me on twitter/instagram, you probably saw that we tried smash cake pictures and they were a DISASTER. She hated it. But we had to give it another try for the party…she actually kind of picked at it and didn’t freak! I’ll call that a win. After eating the little bit she did. 🙂 You can tell she was starting to wear down at this point. We also had an after-cake outfit by the incredible Ashley! I hate I didn’t get more pictures outside. Of course, the weather wasn’t great Saturday…leave it to me to throw a sunshine-themed party with thunderstorms outside. 🙂 That’s why the lighting in these pictures isn’t great. But we did get a few hours of no rain during the party. We had a ball pit and a bouncy house, but I just forgot to get a picture of the kids playing. They all had a lot of fun though! I did get this sweet couple of pictures of Noah and Emma Ramey after the party. Love these two! It was a great day. I can’t believe this girl is almost ONE! !